Rising home prices and mortgage interest rates have pushed housing affordability to its lowest level in five years, according to the National Association of Home Builders. 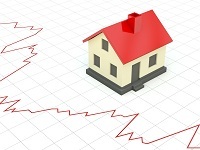 The NAHB/Wells Fargo Housing Affordability Index for the third quarter of 2013 dropped to 64.5. That means families at the median income level could afford 64.5 percent of the homes sold in the three-month period ending September 30. The index is down from 69.3 the previous quarter — the steepest decline since the second quarter of 2004. The index could well continue its slide. Lawrence Yun, chief economist for the National Association of Realtors, recently forecast that home prices will rise 6 percent in 2014 while total home sales would remain flat. Yun suggested that an increase in new construction could help overall affordability. 2013 will see only about 960,000 housing starts, which is about half of what’s needed to spur stronger growth in the housing market while easing affordability, Yun said. But NAHB officials said builders are being squeezed by rising construction costs.